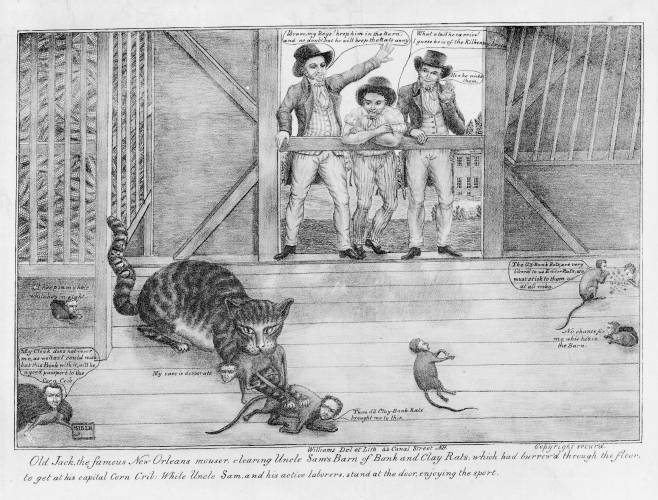 Jackson is portrayed as a cat (with a tail marked "Veto") defending the corn cribs in "Uncle Sam's Barn" from rats "which had burrow'd through the floor, to get at his capital Corn Crib: While Uncle Sam, and his active laborers, stand at the door, enjoying the sport." The cat has one rat in his mouth, possibly Henry Clay, who says, "My case is desperate." Under his paws is another (possibly the Bank's president Nicholas Biddle) who says, "Them d'd Clay-Bank Rats brought me to this." In the lower left a rat with a cape and his paw on a Bible says, "My Cloak does not cover me, as well as I could wish, but this Book with it, will be a good passport to the Corn Crib." Other rats creeping from holes in the floor say, "I'l keep in my hole while he's in sight" and "No chance for me whie he's in the Barn." At the upper right two rats (possibly influential pro-Bank newspaper editors James Watson Webb and Charles King) nibble corn, remarking, "The U.S. Bank Rats are very liberal to us Editor Rats, we must stick to them at all risks." From an open doorway three men, "Uncle Sam and his active laborers," survey the scene. First man: "Bravo my Boys! keep him in the Barn; and no doubt, but he will keep the Rats away." Second: "What a tail he carries! I guess he is of the Kilkenny breed." Third: "How he nicks them." The use of rats to symbolize corruption was commonplace in cartoons of the 1830s, particularly with respect to the Bank of the United States. See ""This is the house that Jack built"" (no. 1833-6). For their use in another context see ".00001. The value of a unit..." and "The Rats Leaving a Falling House" (nos. 1831-1 and 1831-2).